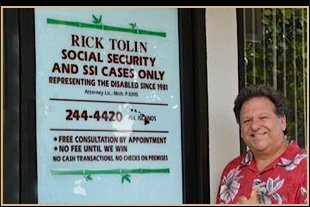 For more than 30 years, Social Security disability Advocate Rick Tolin has worked to obtain rightful payment of benefits from the US Government for people who are too sick or too injured to work full time, and for sick or injured children. Since becoming an Attorney in 1981 (MI., P-33115), he has been assisting the disabled in claims against the federal government seeking retroactive and monthly benefit checks, and Medicare health insurance. If you or your child suffers from injury or disability, you can count on representation by Rick Tolin. When we win your case, you will also receive Medicare and / or Medicaid health insurance. Don't let legal issues stand between you or your child, and your rights. Get the representation you need to fight injustice and get the social security you deserve when you call Rick Tolin. You should never accept a denial of your right to Social Security based on injury, disability, or otherwise unforeseen circumstances. With Rick Tolin on your legal team, you can get the monthly cash benefits you deserve. Since becoming an Attorney in 1981 (MI., P-33115), he has been assisting the disabled in claims against the federal government seeking retroactive and monthly benefit checks, and Medicare health insurance. Rick has extensive experience in all aspects of Social Security law and litigation. He represents and provides ongoing advice to people who are unable to work, and ensures that your claim for social security disability is filed correctly and thoroughly.